Sept. 7, 2017, 12:20 p.m.
That overall percentage is only up slightly from 62 percent in 2016, in the run-up to the November election. But among specific demographics, using social media for news has increased: 74 percent of non-white U.S. adults now get news from social media, up from 64 percent of that group who got news that way in 2016. Fifty-five percent of Americans 50 and older say they’ve gotten news from social media, up from 45 percent (older people are also driving the increasing percentage of people who get news via mobile). — In 2017, 74 percent of Twitter users said they got news from Twitter, up 15 percent from last year, possibly thanks to President and tweeter-in-chief Donald Trump, who has taken to making official U.S. policy statements there. 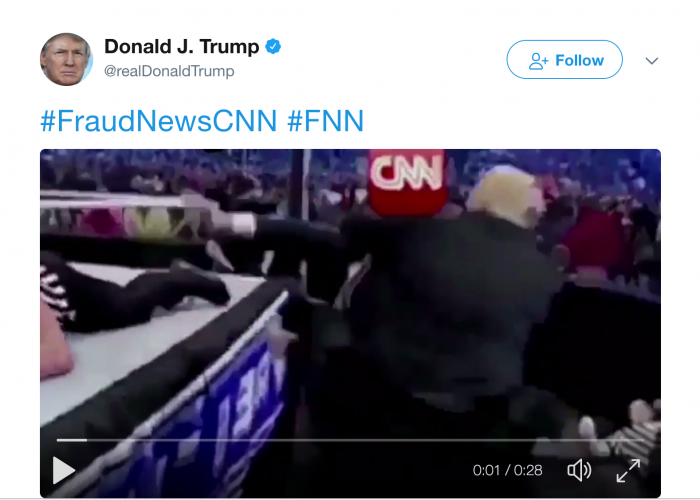 — 32 percent of YouTube users report getting news there, up from 21 percent last year. — 29 percent of Snapchat users now report using it for news, up from 17 percent in 2016. This should be a welcome number for all the publishers investing massively in Snapchat Discover. Wang, Shan. 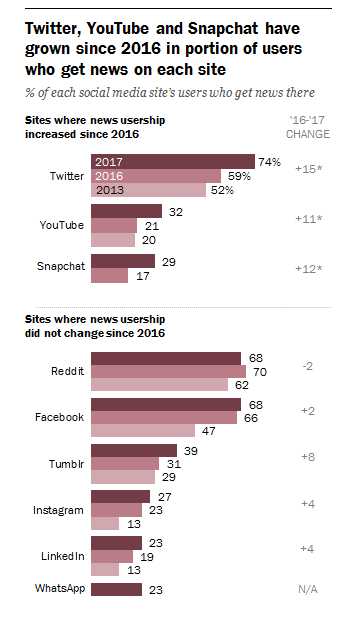 "67% of Americans use social media to get some of their news; Twitter and Snapchat for news are getting more popular." Nieman Journalism Lab. Nieman Foundation for Journalism at Harvard, 7 Sep. 2017. Web. 24 Apr. 2019. Wang, Shan. "67% of Americans use social media to get some of their news; Twitter and Snapchat for news are getting more popular." Nieman Journalism Lab. Last modified September 7, 2017. 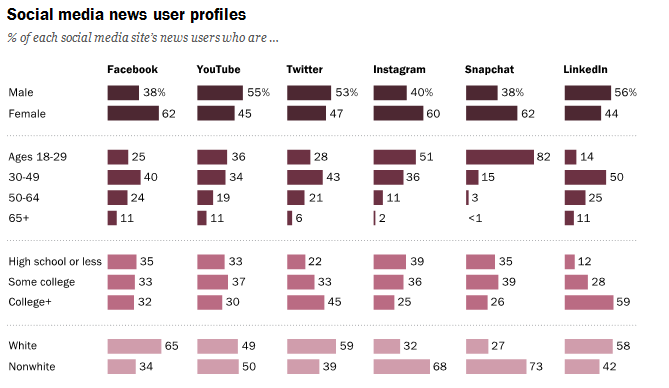 Accessed April 24, 2019. https://www.niemanlab.org/2017/09/67-of-americans-use-social-media-to-get-some-of-their-news-twitter-and-snapchat-for-news-are-getting-more-popular/.